Remarkable alone for the stoic Gothic Revival architecture, this historic church can be found both in Downtown Atlanta on the northwest corner of Peachtree Street and Porter Place and on the U.S. National Register of Historic Places. The enduring look provides a solid contrast to the intricate red-brick Imperial Hotel located across the street. 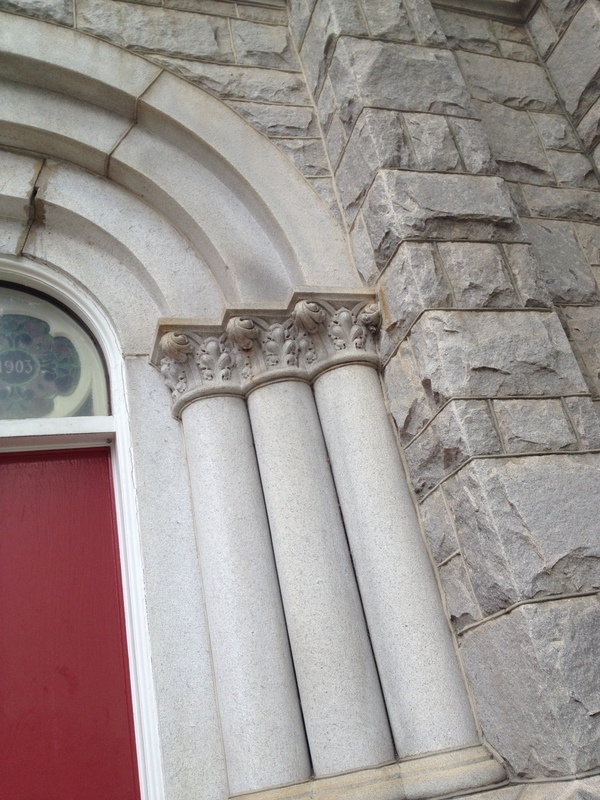 Scratching deeper than the heavy Stone Mountain granite, one discovers a church record intimately braided into Atlanta history. It is home to Atlanta First United Methodist Church, one of the Gate City’s first religious congregations. The Gate City nickname was earned during the 1880’s when the city exploded in population, just one of the many names attached to early Atlanta. Similar to its home city the congregation that resides inside this structure has carried numerous names over time. It has been known as the First Methodist Church, the First Methodist Episcopal South and the Atlanta First United Methodist Church (the current name). The history of church membership is quite noteworthy, with senators, governors, congressmen, judges, famous journalists and more serving as members. It is the same Methodist congregation that resided in Wesley Chapel from the late 1840’s until 1870, the only church structure mentioned in Gone with the Wind. That makes this building the direct architectural descendent of Wesley Chapel, the legendary structure that survived Union shells and General Sherman’s torches during the Civil War. The story of Wesley Chapel and the Methodists who worshiped in early Atlanta begins in 1847 when a log house known as the Old Union Sabbath School, an interdenominational chapel, was getting crowded. 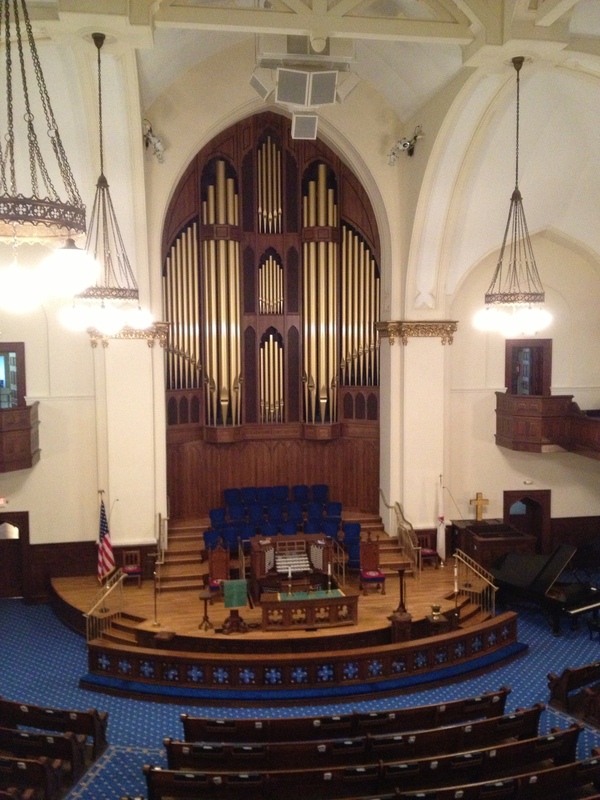 Up to five different religious groups including Presbyterians, Methodists and Baptists used this building for their services and meetings. Out of this group the Methodists built their own place of worship first, completing Wesley Chapel in 1848. Wesley Chapel was demolished in 1870 when a new church was built. 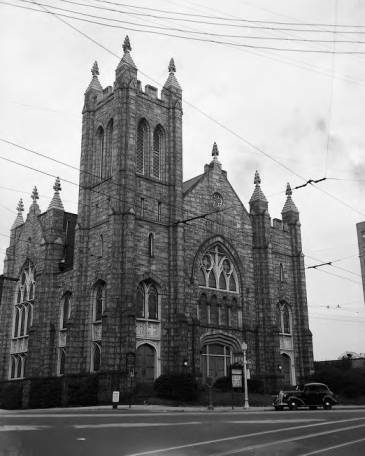 Residing on the current site of the magnificent Candler Building, this new 1870 Methodist church was massive in scale and the centerpiece of Atlanta during Reconstruction, offering a main spire that stood 180 feet over a brick Gothic facade. It was Atlanta’s tallest when built in 1870 and was used as a point of reference by citizens. The city changed drastically between the years 1870 and 1900. By the turn of the century the environs of Downtown Atlanta became more urban. Members formally walked to service, but now were found in more remote areas. That’s when plans to move to the current site pictured here were begun. This parcel of land, only a half mile north of their previous downtown home, was purchased from Sam H. Venable. He was one of two brothers who owned and quarried granite from Stone Mountain and deeded a portion of Stone Mountain to the United Daughters of the Confederacy for a Confederate Memorial. Some church members were concerned this new site was too remote but the move was made without hassle. 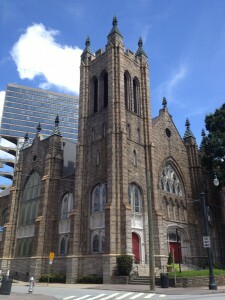 Architect Willis F. Denny designed this Gothic Revival church, which was completed in 1903. He is the architectural mind behind the Wrecking Ball Brewpub in Inman Park (formally the Kriegshaber House built in 1900) the demolished Piedmont Hotel and Rhodes Hall (both built in 1903). 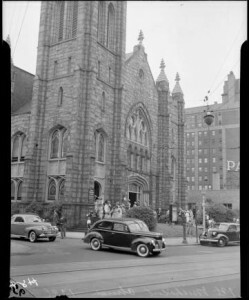 The former 1870 church site was sold to developers backed by Asa Candler, and the old church was dismantled and demolished to make room for the Candler Building. So since 1903 this structure made from Stone Mountain granite has been home to Atlanta’s oldest Methodist congregation. Despite the many moves during the 1800’s one physical object has been passed through the generations, a relic of Atlanta history sometimes forgotten. It is surely the historical gem of the Atlanta First United Methodist building, the silver and brass church bell that resides in the square tower. This church bell is the only Atlanta church bell known to survive the Civil War. 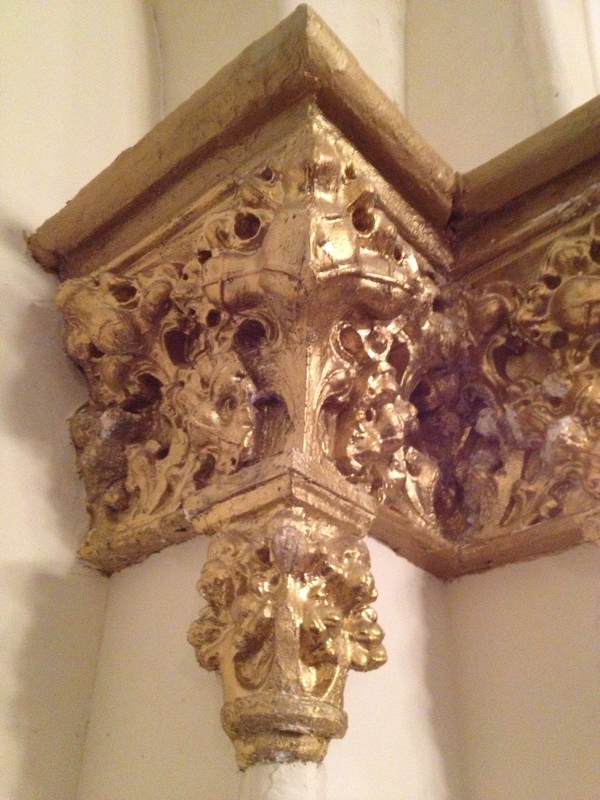 It was cast by the Meneely Bell Foundry of Troy New York for the Atlanta Methodists in 1850 at a cost of $300. One church member donated 100 Mexican silver dollars to be used in the cast, since silver improves the tone and range of the bell ring. A tower was constructed next to Wesley Chapel for the bell, and it solemnly swung for years until the swirls of war stirred below. Why did this church bell survive General Sherman’s burning of Atlanta? Beginning in 1861 with the start of the Civil War most church bells in the South were melted down and turned into military supplies and armaments like cannons. For the city of Atlanta it was decided one church bell must remain, and that church bell was the one pictured right that currently resides in Atlanta First United Methodist’s bell tower. At the start of the Civil War most of the city could be found within a one mile circle. Throughout the war the bell pictured here was used by not only the church but the city to sound alarms for fires, riots and more. Ultimately it sounded the alarm as General Sherman and his Union soldiers approached the city in 1864. 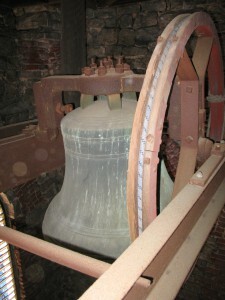 The church was protected by Sherman’s orders during the occupation, and the bell survived the war with Wesley Chapel. 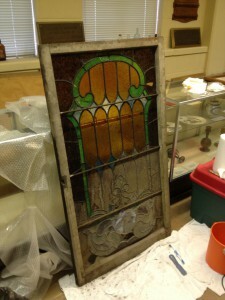 It was passed down as the congregation moved from the center of downtown to the current Peachtree location. When History Atlanta visited the historic bell it could only be viewed from 30 feet below inside the bell tower, a large portion of the rickety wooden steps leading up to it gone. 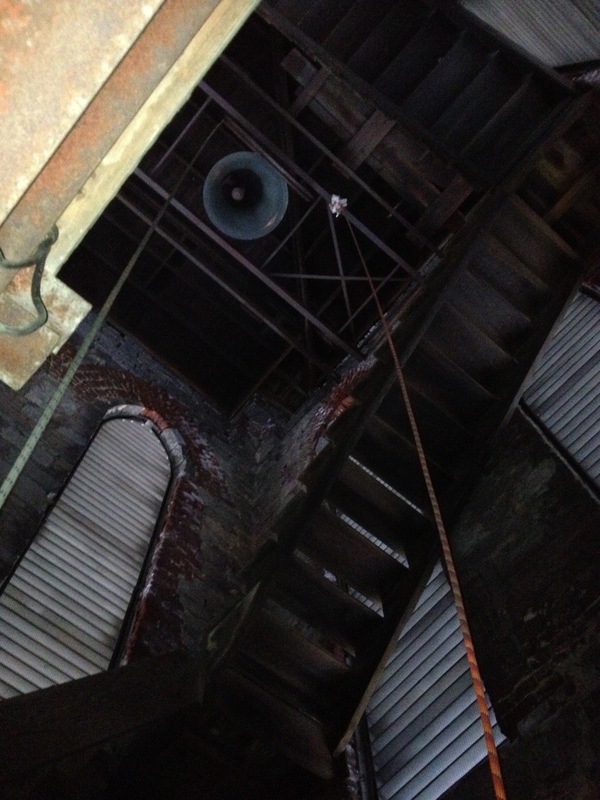 It would be nice if these stairs could be repaired, allowing an up close view of this historic church bell and a chance to educate the public. Obsessed with the growing need to care for the homeless in Downtown Atlanta, the bell tower stairs are one of the last priorities of this church, where they should be. But perhaps one day a benefactor will step in and repair these stairs for this church, which is doing so much to help those in need in Atlanta. Many thanks to the friendly staff at Atlanta First United Methodist Church including Cornelia Witte, Steven Colly and Ariel Merivil along with church historian Carol Colly, a wonderful source of Atlanta history who graciously allowed me to climb up the bell tower to take pictures of the church bell. The church is located at 360 Peachtree Street, NE Atlanta, GA 30308 and can be reached by calling 404-524-6614. Did You Know? This parcel of land that was purchased in 1902 for $28,000 is currently valued by the Fulton County Board of Assessors at $3,782,100. Did You Know? The earliest archaeological evidence of bells dates from the 3rd Millennium B.C.E. in China. Did You Know? Campanology is the study of everything that has to do with bells including bell technology (casting, metals, etc. 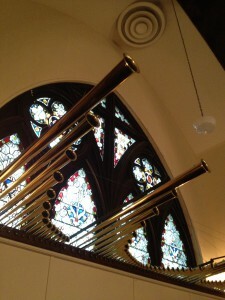 ), how they sound (tune, etc.) 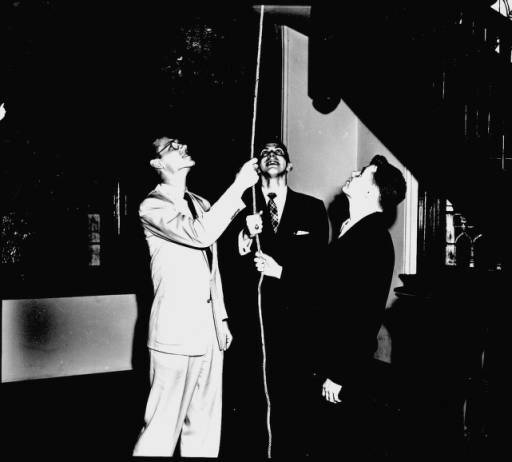 and the history of bell-ringing (traditions, customs, music, etc.). Did You Know? This church structure cost $161,000 to build in 1903. Did You Know? The Atlanta First United Methodist Church has 14 turrets. Did You Know? Air conditioning first came to the church sanctuary in 1964. Courtney Chesebrough Whistler liked this on Facebook. Just followed you on Facebook. I drive by this church everyday. Emily Waldron liked this on Facebook. Kasey Bradley liked this on Facebook. Dru Shields liked this on Facebook. Heather Rowell Clancy liked this on Facebook. I lived around the corner from that church and never knew it. Audrey J Westerfeld liked this on Facebook. That’s so cool!! So are you living and wrking there now? Yep. I live in Midtown right near Piedmont Park. Moved here on Memorial Day. I still work for clients back in Indy. Bryan Pahl liked this on Facebook. Canaan Allen liked this on Facebook. Mark Fidler liked this on Facebook. Kelly Minta liked this on Facebook. Ron Newlin liked this on Facebook. I use to live at the end of west peach tree right before the 75 ramp. I LOVE Piedmont park and that whole city so much!! !